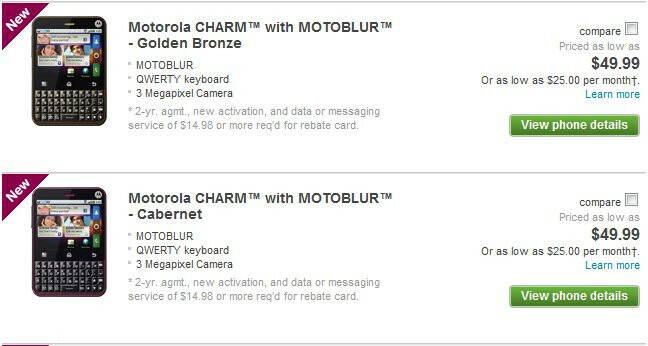 Although it may not be regarded as a substantial drop in price, T-Mobile still nonetheless reduced the price of the Motorola CHARM by a mere $25.00. Launching with an on-contract price of $74.99, we now see the unique looking Android powered smartphone at a healthy $49.99 – which does still look good on paper; especially at that price point. Naturally, the pricing is good for both new and existing customers who have a qualified upgrade. At $49.99, the Motorola CHARM might rely on its charming looks and cheaper price point to really catch the wandering of eyes from customers in the market of buying a handset. However, it's hard to say why the handset is already receiving a reduced price, but maybe it'll be able to muster up some decent sales now that it's better priced. I read someone elses comment one time saying that Manufacturers should stop releasing low end Android phones and just go after the high end market and let the cheaper Android handsets be populated by older models of high end phones. I have to agree with them now. Motorola still hasn't given my Cliq XT it's upgrade I've been waiting 5 months for. Then they canceled updates for a whole slew of other low end handsets. Which tells me, don't buy anything but a high end handset if you want support. Samsung did this with the Behold 2, Moto did this with all their low end phones. So sadly, as much as I HATE apple I think manus need to follow suit with them, make only high end phones, and provide updates for 2-3 years. Otherwise I'm going to switch camps to WinPhone7 or something. This dropping of support once the handset is sold is ridiculus. I'll never be a mactard, but I can't put up with being ripped off by Android manus. lol, what does this have to do with the phone.. and technically, PA, the price went UP. When the Charm was launched, it was part of the back to school promotion which is FREE after rebate without having to BOGO. 75 with a 75 rebate = 0. Now its 50 after mail in rebate.. 100 with a $50 rebate = 50. It is also the same price as the original cliq which is j$50 after rebate... or if the store pricematches online, the cliq is FREE after rebate.